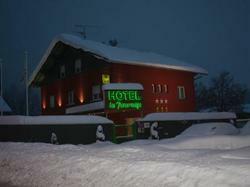 Set on the edge of a fir tree forest, this hotel is located in Bonnétage in the Franche-Comté region. It is just 13 km from the Swiss border and offers free Wi-Fi and a restaurant. TVs with Canal + channels are provided in all of the guest rooms at Hôtel Les Perce-Neige. They are all heated and feature parquet flooring and en suite bathrooms with hairdryers. Traditional cuisine and regional specialities such as fondue, raclette and tartiflette are proposed in the restaurant. Breakfast can be enjoyed daily in the breakfast area or in the comfort of your room. Free parking is available on site and Maîche is just 9 km away. The hotel is 65 km from Besançon and Besançon-Viotte Train station, and Montbéliard is reached by car in 50 minutes. Parquet flooring and a TV with Canal + channels feature in this en suite room.